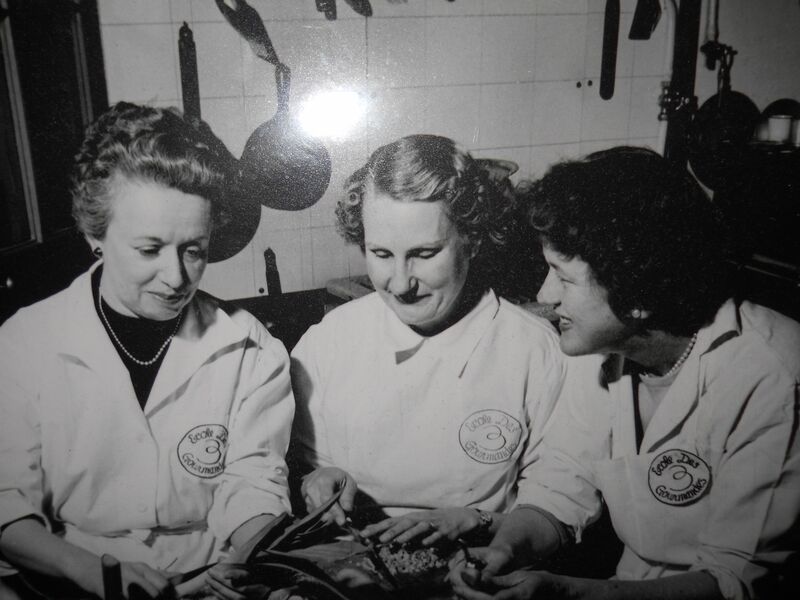 This photo of “Les Trois Gourmandes” hangs in my kitchen. I like to think of them as my kitchen guardian angels. I owe all of my interest in cooking and food to Julia Child. In the 1970s, her show would be on in the late afternoon on PBS and I watched in awe as she cooked something exotic and delicious-looking; I always wonder if that’s why to this day I have an urge to step into the kitchen and start cooking in the late afternoons on the weekends. Wanting to emulate her, my first step in cooking was whisking scrambled eggs with flour (my brother still reminds me to this day of my first “recipe.” And yes, it tasted like eggs and flour and went to the compost pile.) I was an early riser even when I was young, and one morning decided to make hors d’ouevres for my parents before 8 a.m (Ritz crackers topped with cheese and an olive. They were kind enough to eat them in their half-awake state.) 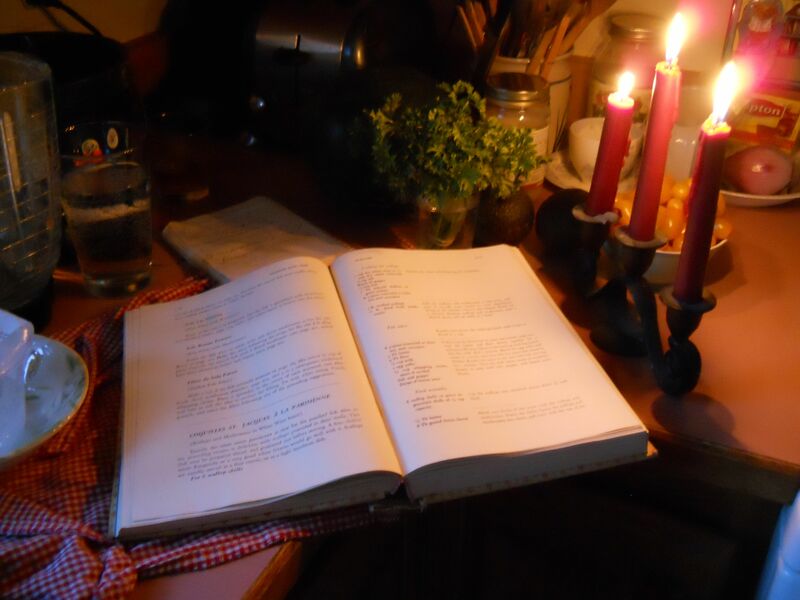 When I got a little older, I used to borrow her cookbooks from the library, poring through the pages and dreaming of menus I’d cook for my future guests when I was an adult. I have nine of her cookbooks on my shelf, the most of any other cook. To this day, if I’ve had a bad day, I know her cooking show with Jacques Pépin is on at 7 p.m. and just watching it relaxes me and puts me in a better mood. So I’ve watched cooks around the country join me on the Julia Child bandwagon for a celebration of what would be her 100th birthday today, August 15. Since I’m out of town today, Saturday night’s dinner was going to be in tribute to Julia and would completely be from Mastering the Art of French Cooking. This also gave me time to spend in the kitchen, cooking in homage of this master cook. How does the phrase go about the best laid plans? I wondered when I went to bed that day if someone was testing me to look outside the box. I awoke to a dreadfully humid day. This summer has been the three H’s, hazy, hot, and humid, and Saturday was no different. I took my usual long walk a little after 6 and by 6:15 I was drenched in sweat. But no matter, I had cooking to do this day! We ran errands and did all our grocery shopping and were home around 2:30. 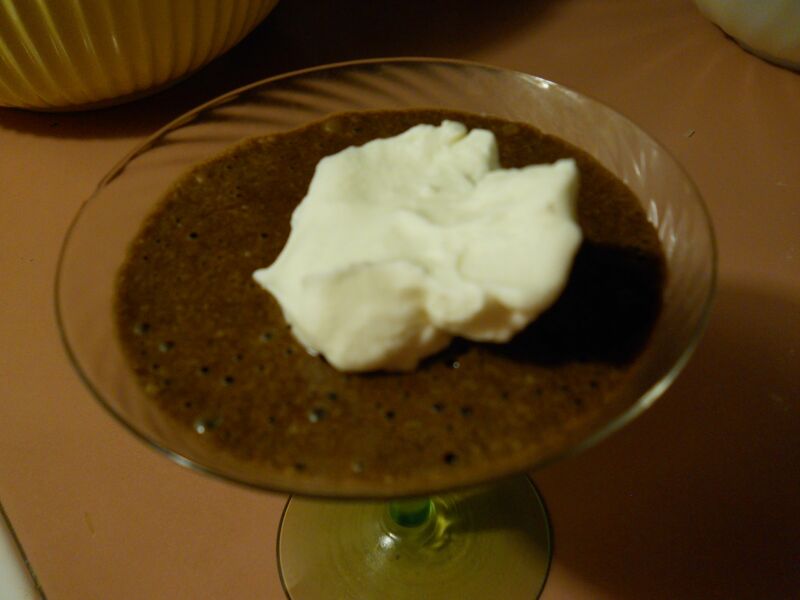 I put everything away, washed the breakfast dishes, and had the house to myself–I was going to prepare the chocolate mousse! I read the recipe carefully, dividing the eggs by their yolks and whites, and started preparing. I had exactly ¼ cup of Triple Sec left, perfect. I started whisking and whipping over the double boiler as instructed. About 10 minutes into this, I realized I was whisking the whites not the yolks. Now, this is where living in the country is a pain in the neck. I was furious with myself over this error and I had two options, put everything away for another day or travel to town and pick up more Triple Sec. After much consideration, I chose the latter, and also picked up some super fine sugar, as I also didn’t have enough at home. A short visit with a friend, and we were home a little after six. Still plenty of time to make dinner! With the chocolate mousse properly made, I moved on to the tomatoes. The tomatoes waiting for the oven. The two recipes took a little bit under an hour. I was still on track time-wise. I sat down to watch a little bit of the Olympics with a small glass of wine when the electricity fluttered. It looked like it was going to rain, but not a storm that would take out the electricity. I breathed a sigh of relief, my mind going to the fridge, with the scallops, fish, and cooling chocolate mousse. I returned to the kitchen, turned on my computer to listen to music, and the lights went out. This time, for good. 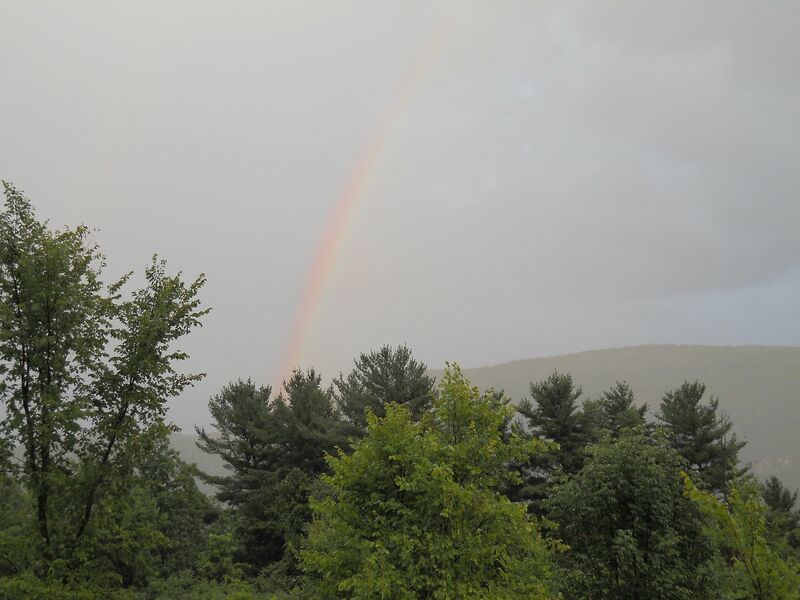 After the rain, a faint rainbow bowed over the mountains and was lovely. The sun came out, but the electricity was still off. It started to get dark. Since we have a gas stove, I could use the stove top, but I needed the oven. Then I thought, I’m going to just cook everything on the stove and forget about the oven; I’d cook the tomatoes in the morning. 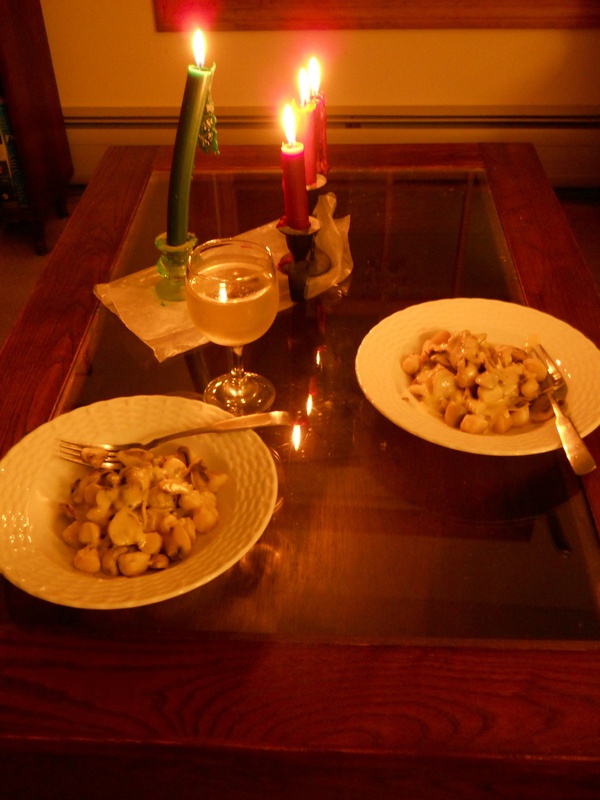 Cooking by candlelight isn’t as romantic as it may look and certainly isn’t the most ideal situation, but I was able to make the scallops and its sauce. I was thrilled, there really was no reason to pop them in the oven at all! I plated the food, brought the candles to the living room and just as I brought in the wine and was about to sit down, the lights came on. This time, for good. So at 9 p.m., I started to make the fish, cook the tomatoes, I gave up on making the hollandaise, and washed the batches and batches of dishes that had accumulated. The scallops were rich, a little too rich for me; the fish overcooked a little bit, I thought; the tomatoes were delicious and a hit; and the chocolate mousse? Taking that trip to town was well worth it too, when I saw my number one eater dig into his dish, and silently return to the kitchen for seconds; I was tired and set mine aside for the next day. And after giving a serving on to a chocolate-loving friend, the request has been made to bring another batch along for this week’s annual trip to Lake George. So WWJD? “The only real stumbling block is fear of failure. In cooking you’ve got to have a what-the-hell attitude,” she is quoted as saying. To good food and good eating! The recipe served with asparagus can be found here. A wonderful tribute to Ms. Julia Child. You are a great Chef Ms. K! I think Julia would have laughed at your experiences and enjoyed you and your attempts. —I got cut off (did the electricity go??) I was saying, I remember the breakfast hors d’ouerves with a smile—-so does Dad. 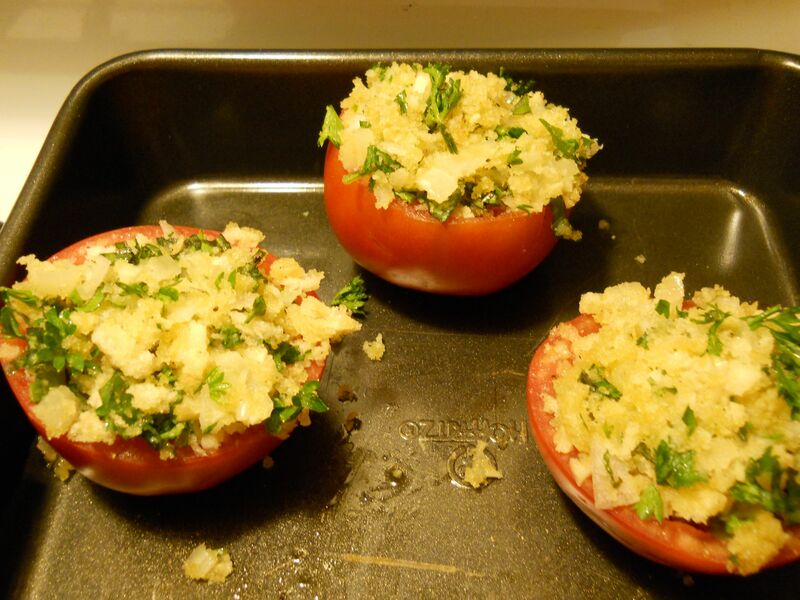 A great way to use those Jersey Fresh tomatoes in your backyard!